Join us on October 19, 2019! 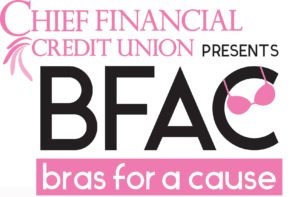 Bras for a Cause is a fashion show like none other. Cancer survivors, art bras and big fun are all showcased at the annual event on October 19, 2019 at the Royal Oak Music Theatre. The event features live and silent auctions, food from some of the finest local restaurants, live music and an inspiring breast cancer survivor runway show. Monday - Thursday: 10-8 p.m. Saturday 12-3 p.m.